Ever Thought of Giving Up? I’ll never forget the day a colleague came into my office and slammed a newspaper article on my desk. She was distraught. Her voice quivered, and she stuttered as she tried to tell me what had made the news. I picked up the newspaper page and as I listened to her recap of the story, I skimmed the article. Suddenly she stopped. “Are you ok?” she asked. “You look ghostly pale,” she added. I had to sit down. The news article was on the death of a single mother and her three small children. The young mother had killed each of her children, before she took her own life. (I’ll spare you the details, they’re too horrific.) I stared at the newsprint. It was impossible to comprehend how a mother could do that to her own children. My colleague grabbed my left shoulder and shook me, trying to get me to speak. I looked up at her and started to cry. I couldn’t control the emotions. I couldn’t stop the tears. Those three children were the same ages as my children. The mother was only a few years older than I. How? How could this have happened? Had the people in her circle of influence not seen it coming? Had she been so clever to cover up what was going on inside her? – These were all questions my colleague asked that day. I’m sure there were many more people that had the same questions on their mind. I know it’s possible to hide the truth from even the closest people in your life. Our lives are totally falling apart, but we can still act and put on a great show. No matter how hard it is, don’t give up. Don’t hide it. Talk to a friend or a family member and ask for help. There is always a way out. There really is. No matter what your mind keeps telling you, you are not alone. By the grace of God I did make it this far. But I never forgot the woman who didn’t. Her story kept me clinging to Jesus more than ever. There were times I barely hung on by the skin of my teeth. God has been faithful, always! He provided all I needed all these years. He redeemed and restored beyond my wildest dreams. God can do it for you as well. Will you let him into your darkest places of your life? He promises his peace and a light in your darkness. Don’t ever give up! 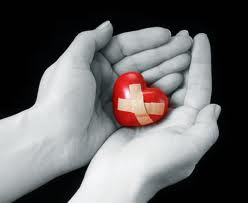 Who Would Want to Mend a Broken Heart? A year ago today I thought I wouldn’t make it through this day. And here I am, very well alive a year later. Why was August 22, 2012 such a hard day for me? It should/could have been my 25th wedding anniversary! Instead I was remembering the pain, the suffering I had experienced. One wrong decision I made 26 years ago put me on a road I never thought I would have to travel.